So Leon wanted a hedgehog cake for his 4th birthday… He also wanted one for last year’s birthday, so I’ve had a year to improve it. Fondant icing definitely makes all mistakes disappear! 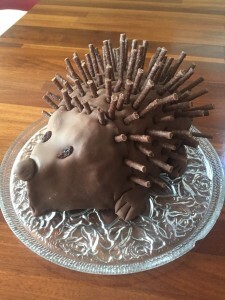 I used a combination of this recipe and this method… plus a layer of chocolate fondant icing to hide the mess of the cake underneath and a lot of butterscotch Matchmakers for the spikes.